People really do not need health insurance for regular small expenses, as they do not need car insurance to “pay for” oil changes. And any insurance system relies on an underlying cash market to find what the right prices are. Collision insurance works reasonably well because there is a supply and demand market for auto repair in which people pay their own money and there are competitive suppliers and free entry, offering services along a wide quality-price spectrum. Perhaps it’s clearest right there: “the companies that actually pay for the medicines, which we call payers.” What happened to people? Notice also the graph. If you think it’s been getting a lot worse in a short time, you’re right. Let’s assume you have a new product you want to sell. You were planning on selling it for $10, but the government is going to force you to discount the product 50 percent. Do you go ahead and sell it for $10, or do you charge $20? Of course, you charge $20, and if you had to think about that, you probably shouldn’t sell a product yourself. 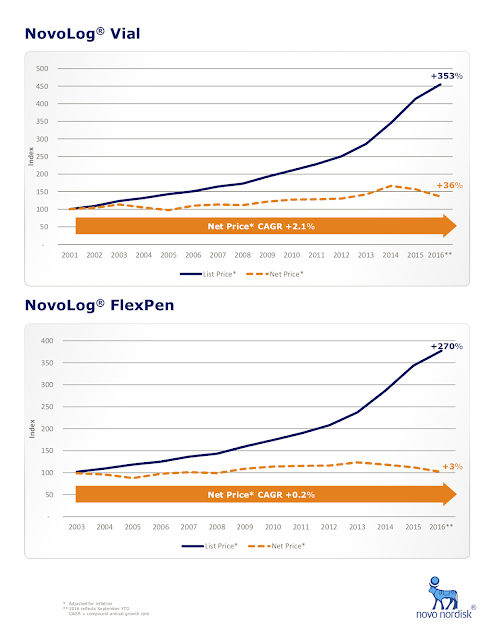 For patients, the reality is that many of the insured may benefit from the net prices payers negotiate (on average, insured patients pay a co-pay for Novo Nordisk insulins between $1 – $1.40 per day) while others may not. Uninsured patients or those in certain insurance plans may be subject to list price. For instance, there are a growing number of people enrolling in high-deductible health plans that are facing higher costs at the pharmacy counter. In our view, high-deductible health plans are becoming a greater part of the affordability issue requiring attention. But just what kind of attention? Here, the otherwise crystal clear prose slips in to waffling. We currently offer several options for eligible patients including a Patient Assistance Program and co-pay cards to defray costs. Our own system of price discrimination via insane complexity. As a leader in diabetes care, we recognize patients need more… We need a partnership approach involving PBMs, insurance companies, employers, patient organizations and policy makers – to help find sustainable solutions. Isn’t a “partnership approach” exactly what got us in to this immense mess? we also need to work together to improve the system and create more transparency. Check out the market for candy bars. There is a markup above the manufacturer, but the end user bears 100 percent of the cost; and therefore the candy bar market is very lean. Healthcare markets can work in a similar fashion.